The RPA designation program serves the educational needs of both third-party property managers and corporate property managers. By familiarizing yourself with the many aspects of operating a commercial building, the program helps you integrate these issues into the broader task of property management. The program teaches you to maximize a building’s net income while minimizing risks. For more information, or to register for our upcoming courses, visit our Education Calendar. Select the course you'd like to register for, download and complete the registration form, and return to Barb Turbett before the designated deadline. A printable course overview is also available to download for your convenience. To earn the Real Property Administrator (RPA) designation, you must have at least three years of verifiable experience as a property manager. This experience must be performed for a portfolio or building 40,000 square feet or larger. Work-related experience must include responsibility in 18 of the 33 categories detailed on the RPA Experience Criteria form located on the BOMI International website. The FMA designation program teaches you valuable skills in strategic planning, project management, corporate finance, capital investment, and physical asset management. This program is for both new and experienced facilities manager, or someone in a related profession who will benefit from knowing how to create a quality work environment that maximizes productivity. 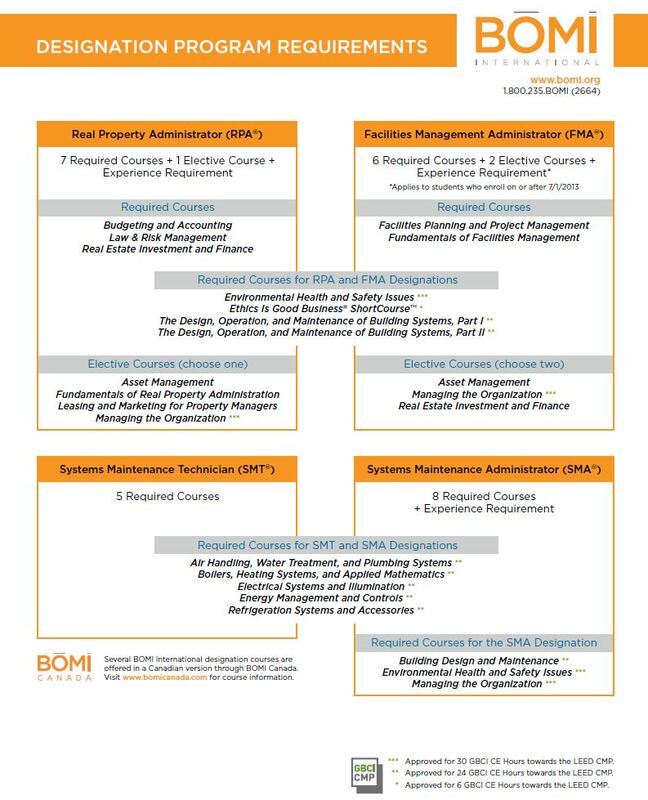 BOMA/Suburban Chicago offers the internationally recognized BOMI International curriculum that leads to professional designations for all levels of property professionals. Real Property Administrator and Facilities Management Administrator courses are taught in the classroom either as seven-week courses or as accelerated (four-day) courses. The full designation cycle spans two years. For those interested in accelerating their completion, self-study and online versions are available directly from BOMI International. The RPA program that I have recently completed has been an amazing journey. The information and knowledge gained has been invaluable and I will take them with me as I look forward to new challenges and successes. Additionally, participation in the RPA program significantly helped to expand my professional network through classroom interaction. I would recommend the RPA courses to anyone wanting to increase their knowledge of the commercial property management industry.